Here we have “I detect, I perceive, I note.” (He’s blind, you see.) “the odor, the spirit, the smell of Joseph, if you do not think me out of my head from old age and a bit barmy.” It talks about the spirit that is in it, the east wind that has brought it, etc. And this is a very important thing: “When they placed it upon the face of Jacob, he smelled also the smell of the Garden of Eden. For behold there is not in all the earth another garment that has that smell in it.” This is a unique thing; this is the garment. “For there is not in any other garment on earth of the winds of the garden of Eden, unless it is in this one garment.” So you can see why the brethren were so jealous; it was the garment of the priesthood. 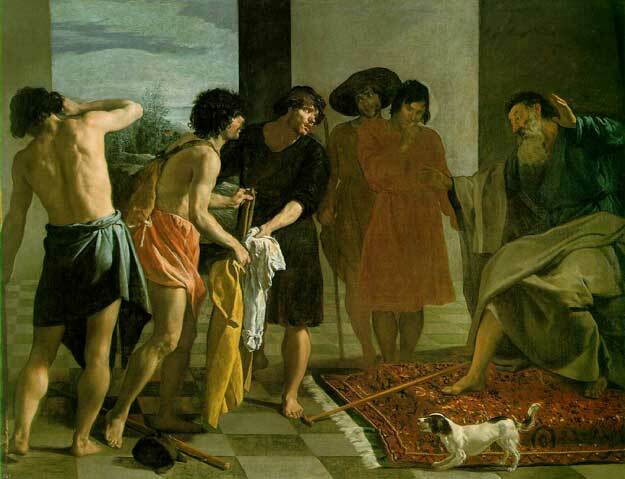 The commentator says he recognized that it was Joseph’s garment by feeling it first because it had three marks in it. This connects nicely with your post on the BYU Egyptian study of the woolen garment. Thanks Justin. The post he is referring to is here. I enjoy your blog, especially since I cannot find my Nibley collection. Somewhere, in the dark corners of my garage, sits a box filled with Nibley books. I hope to find it someday soon. Thanks for visiting Brian. I wish I had more time to read Nibley. I’ve only read a few of the collected works. So much material… so little time. BTW, I’ve almost got that guest post finished. Very interesting read. Thank you for the reference! I wonder what the marks would have been. Not likely similar to our Masonic markings.